What makes a sweet onion so sweet? It’s not necessarily more sugar, although some sweet onions do have a high sugar content. The main reason sweet onions taste so much sweeter than other onions is that they are low in sulfur compounds, especially pyruvic acid, which gives regular, or storage, onions their pungency. It’s pyruvic acid that accounts for the bite in the mouth, the tear in the eye, and for some, the pain in the stomach after eating raw onions. Because they’re milder, sweet onions are a great choice for eating raw, and they cause less tearing, so you can chop away without donning swim goggles. Sweet onions go by many names—Vidalias, Mauis, Walla Wallas, OsoSweets, Texas Sweets—but they all have one thing in common: They are grown in a region where the soil is low in sulfur. They all tend to be large, although they vary in shape from round to flattened. Sweet onions are traditionally a spring and summer crop. However, new varieties, new sources in the southern hemisphere, and improved storage capability have filled in the gap, so now we have some kind of sweet onion available much of the year. (See panel below). Maui: In season May through December. Smaller than other sweets. OsoSweet: From South America. Available January through March. Very high in sugars. Texas Sweet: Two kinds: Spring Sweets and Texas 1015 Super-Sweets (the number refers to the optimal planting date, October 15). Available March through June. Vidalia: In season April through June but available into the fall. Walla Walla: Available June to August. 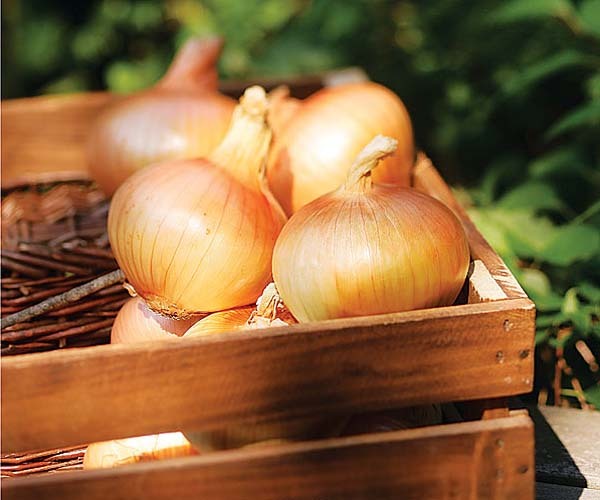 Sweet onions are fragile, with tissue-thin skins, and full of juice, so treat them gently. They won’t keep for months, as do storage onions. Buy firm bulbs with no soft spots, bruises, or other signs of damage. The necks should be tightly closed. If you plan to use them within a week or so, you can leave them out on the counter. For longer storage, put them in a cool place, protected from light; an open brown paper bag works well. If space is tight, hang them in the basement knotted one by one in the leg of a pair of pantyhose—you don’t want them to touch. You can also store them loose in the fridge’s crisper drawer, on top of a piece of newspaper, to keep them dry. Just don’t store them in a plastic bag; their juiciness makes them prone to mold. Sweet onions cook quickly, thanks to all those juices, but their lack of pungency means they’re not well suited to be used as an aromatic in place of regular onions. 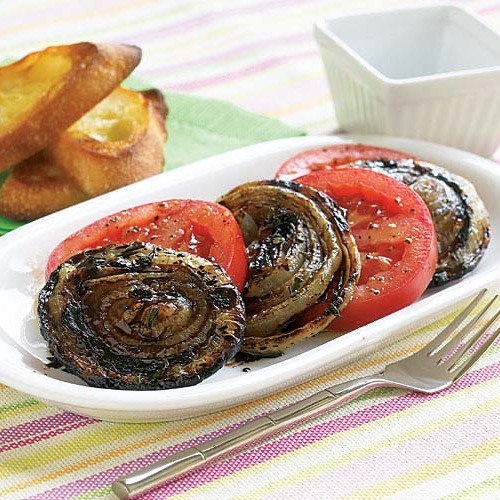 Instead, use them raw or where onion is the main ingredient, so their mildness can shine. Seasonings that complement the sweetness include salt and pepper; warm spices like nutmeg, cumin, paprika, and hot pepper; herbs like thyme, sage, rosemary, and oregano; aromatics like capers, olives, and anchovies; and vinegar to play counterpoint. Onion confit is great as a condiment for meats, a stuffing in a rolled roast, a pizza topping, or a savory tart filling. Slowly cook sliced sweet onions in a little olive oil until meltingly tender and caramelized, stirring from time to time. Finish with a splash of good-quality vinegar (sherry, red-wine, or balsamic). Roasted onion slices are a delicious side dish on their own, but they’re a versatile ingredient in sandwiches, pizza, focaccia, and salads, too. Roast thick slices, well seasoned and oiled, until lightly browned. Finish with a dash of vinegar. Onion rings need no explanation. Slice sweet onions 1/2 to 3/4 inch thick and separate into rings. Dip into a batter of flour and beer and deep-fry until golden. Sprinkle with salt and enjoy warm. To learn how to slice perfect onion rings, check out our test kitchen tips. Raita is a cooling condiment that’s delicious with grilled meats and fish, roasted vegetables, or plain rice. Marinate chopped sweet onions in rice vinegar for half an hour, drain, and stir into plain yogurt with lots of minced herbs (basil, mint, dill, chives, cilantro, or a combination). A salad with orange slices plays up the sweet side of onions. Vary the dressing and additional pairings to suit your menu. Add jícama and avocado and dress with a lime-cilantro vinaigrette. Combine with sliced cucumber and dress with a sesame-soy-ginger vinaigrette. Or toss in a cumin-spiked vinaigrette and serve over butter lettuce or spinach, garnished with mint. A zesty salsa cruda is good with tacos, grilled fish, or grilled meat. Combine diced sweet onion, avocado, ripe tomatoes, and red pepper with olive oil. Season well with salt and pepper and a little cumin. Add a liberal handful of chopped cilantro and squeeze in some lime juice. Stir gently and let sit for an hour or so to let the flavors meld. Onion sandwiches are for true onion lovers. Spread mayonnaise on one slice of dark bread, sharp mustard on another. Cover the mayo with a thin slice of onion and the mustard with slices of sharp cheese. Or spread two pieces of white bread generously with mayo mixed with chopped parsley and basil and a dash of hot sauce. Add a slice of sweet onion and a fat slice of ripe tomato seasoned with salt and pepper. Eat this one standing over the kitchen sink.